Recently, my youngest daughter, McKenna, passed her driver’s test. She absolutely loves her newfound freedom. Sometimes, a bit too much! She isn’t afraid to drive anywhere. I’m constantly reminding her that she’s a new driver and that we need to continue working together on developing her driving skills. It's a fact: teenage drivers account for more auto accidents than any other age group. However, I’m not going to lie, it’s easy to become complacent after teenagers get their licenses. Let’s face it; we spent months riding around with them teaching them the rules of the road. Why would we want to continue with those stressful and aggravating situations? Parental involvement is a key way to help educate and protect them. Text me when you get there. Here are some other topics I’ve discussed with her. I hope you find them helpful. My daughter recently participated in this class and loved it. She told me she learned so much and feels even more confident on the road. If you’re a West Bend Home and Highway policyholder, you’re eligible for discounted rates for Road America’s driving school. 2. Weather. Different weather conditions can affect how we drive. Rain, sleet, and snow affect traction and braking. What may be common sense to us may not be for new teen drivers. Before letting them drive in a new weather condition, take them somewhere safe where you can talk and they can practice new driving techniques. 3. Animals. This time of year, animals are on the move. Deer hits are very common in Wisconsin. If an animal runs out, instinct is to swerve to avoid hitting it. I constantly remind both my daughters to brake hard and fast if possible; never swerve for an animal. Swerving to avoid hitting an animal can put your teen driver and others into potentially deadly situations. 4. Intersections. Unfortunately, many drivers who get a yellow light speed up instead of slowing down. Today, I see even more people driving through red lights. This tip is critical for new and experienced drivers alike. Always check the intersection to make sure it’s clear before proceeding through on a green light. During a practice session with my daughter, I had just uttered those words and another driver went through a red light while ours was green. A split second sooner and my daughter probably would’ve been taken to the hospital. 5. Clean windshield. Trying to look through a dirty or snow-covered windshield can be dangerous. Light reflecting off a dirty or frosty windshield during sunrise and sunset can make it extremely difficult to see. When the first frost glazes their windshield or the first snowfall buries their car, show them how to clean it properly. Again, what’s common sense to you may not be to your teen. 6. Roadside assistance. If you don’t have it, consider purchasing roadside assistance for your family. For adults, a dead battery or a flat tire can be a nuisance. 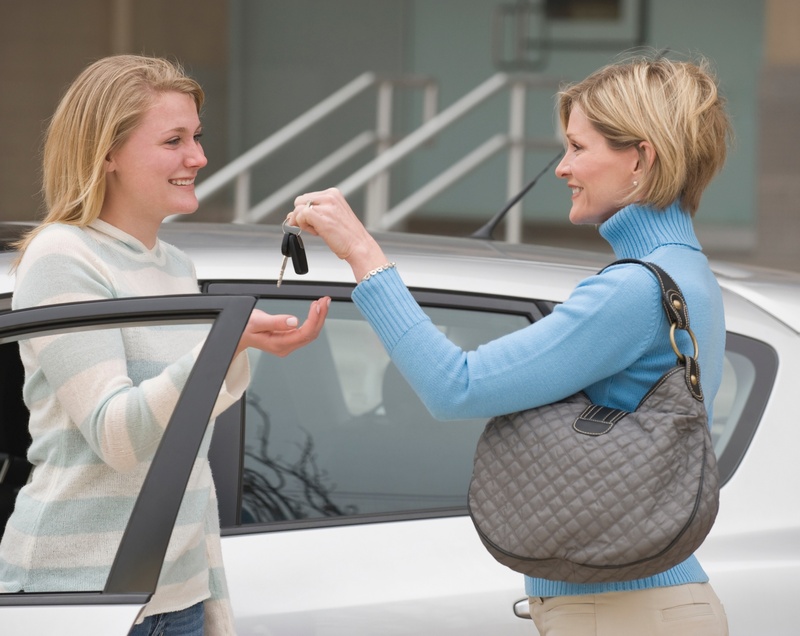 For a new teen driver, it can be a scary situation. Moreover, with increased highway speeds, it’s best to stay in your car. Wait for a professional’s assistance. 7. School parking lot. Depending on the size of your high school, the parking lot before and after school can be chaotic. We’ve told McKenna to get to school early and stay late. A few extra minutes before and after can make a big difference in avoiding congestion and fender benders. 8. Car accidents. Teens are three times more likely to have an accident per mile driven than adults are. Obviously, inexperience behind the wheel is the leading cause. While we hope our teens are not involved in an accident, statistics say otherwise. Discussing what to do after an accident can be helpful for both of you. I’ve already received a phone call from my daughter asking me what to do because she was rear-ended at a stoplight by another student. Luckily, it was just a bump, and there wasn’t any damage. Unfortunately, trying to have a conversation over the phone just after it happened was difficult for us. Planning can make dealing with the first accident a bit easier. 9. Car inspections. Periodically look at their car tires and instrument panels. I’ve explained to my daughters what to watch for, but I’ve learned that sometimes indicator lights are overlooked. 10. Purchase an app. Smartphone apps are available that monitor driving behaviors and send automatic text messages when teens arrive safely at their destinations. This is a good opportunity to monitor their driving, as well as offer additional teaching opportunities. 11. Graduated driver-licensing systems. These systems are designed to progress new drivers through different scenarios over time. Become familiar with your state’s program. 12. Recalculating. Driving to school, a part-time job, or a friend’s house can take new drivers through parts of your city that they’re unfamiliar with or that may present a challenging driving situation. For example, making a left hand turn at a busy intersection that doesn’t have a green arrow can be tricky. If either of these scenarios occur, consider talking to them about finding an alternative route. The next time you’re driving together, give them some guidance on how to successfully navigate through a situation that’s new to them. For additional resources, check out my blogs below.